My father passed away a year ago, March 30, 2014. I wrote down the conversation I had with my father about an hour before he died. My daughter Andrea Petersen read this for my father's funeral. It is entitled, “A Conversation With My Dad”. I was very thankful I had this opportunity. I had about a half hour alone with Dad the morning he died. So I'm thinking what do you say to your father in the few hours before he goes to Heaven to meet Jesus? As was characteristic of our conversations in those last few hours, he was sleeping comfortably and I did all the talking. A number of possible topics of conversation crossed my mind, I'm going to let you in on the ones I chose for a very intimate father-son communication. I told Dad I loved him. That is not something that we stoic Danes talk about a lot, but it seemed appropriate so I told him that several times, just in case he hadn't heard me, you know. I told him Mom was cared for and he didn't need to worry, husbands of 55 years do worry about things like that just in case there is just one more thing they can do for those they love. Then we talked about a few other things that I thought he should know. We talked about his legacy, which is important stuff if you aren't going to see someone again for a while. Like most Danes, Dad had a very personal faith, he quietly took his family to church, explained the plan of salvation to his children, and was faithful in his marriage. He also served his neighbors when they needed a little help here or there. I told him he is a good Dad. He raised three children that are strong Christians and have good marriages. I think that is a pretty good measure of success as a parent. I told him he is a good Grandparent. He had 12 grandchildren, who all know the Lord as Savior. I told him he is a good example. He has a strong work ethic, which his children learned well. I told him he was a good husband. His marriage is a good example to me. I told him he is a good friend. To his children. To his family. To his neighbors. Then we talked a little about his future, since he was standing at the door step of “eternity”. Given the circumstances I thought this was pretty important. I read Dad the 23rd Psalm, especially that part about “walking through the valley of the shadow of death”, I think that was mostly for me, because he seemed at peace with the whole thing. I skipped ahead to the last three chapters of Revelation. I figured he would like to be reminded about the end of the story. The part where “we win,” you know. I don't usually read books that way, skipping to the end, but it seemed the right thing to do in this case. I found the part in Revelation chapter 21 where there will be no more “death, mourning, crying or pain”. Just a couple of verses later it says,“It is done, I am the Alpha and Omega, the Beginning and the End. To him who is thirsty I will give to drink without cost from the spring of the water of life. He who overcomes will inherit all this and I will be his God and he will be my son.” That also seem appropriate given the circumstances. Dad wasn't much of a theologian but I had searched the scriptures on a few items that I thought he would like to be reminded of. I told him, he would soon see his mother Irma and his father Roland. I told him to tell them Hi from Brian, Kim and Kevin. He could also tell them about my organic garden. Irma and “Rock” know about my garden but there is nothing like getting a first hand report. I think Irma, especially would like to know all the details since she was the gardener in the family. They should have plenty of time to go over it in detail, because eternity is like that. I told Dad, Jesus will have work for us to do in heaven, that is why we learn to work and be faithful here in this life. Having work would make Dad real happy. He wasn't real big on vacations, he always liked to be busy and have something to do, because eternity is like that. I told Dad that Jesus was going to ask him to come to heaven soon because He had some farming for him to do. I wasn't sure exactly, but likely he had some hay to make, some corn to harvest or some calves to feed. These were all things Dad enjoyed doing in the last year or so with Kevin and Kendall. God owns the cattle on a thousand hills you know, and some of them are reserved for Dad, because eternity is like that. Heaven isn't just about angels and the Hallelujah Chorus, though there is time enough for that too. Heaven is about things we enjoy like playing dress up like Kaylynn, model trains like Jacob, gymnastics like Ella, riding four wheelers like Noah, teaching children like Emily, choir like Andrea, music like Melissa, flute like Jenna, sports like Kyle and Clarke, electronics like Reed, and worshiping God through farming like my Dad, because eternity is like that. I told Dad in the “New Heaven and the New Earth” he would be farming organically. I think he would like that because there wouldn't be any weeds or insects to bug him. Also, he would get more done because things wouldn't be breaking down all the time and he would always have just the right wrench instead of having to look for them. Everything will be perfect and everything will be new, because eternity is like that. When I join Dad in heaven in a few years I wanted to hear about all his latest growing techniques. I want to talk to him about things like, how tall that corn was and just how many bushels did those soybeans yield and just how did those calves do. Dad likes to talk about such things and I like to listen. There will be plenty of time, because eternity is like that. In the “New Earth” Dad can walk for hours through the fields just checking things out, that was another thing he liked to do. When I was little about the age of Ella, Noah, Jacob, or Kaylynn, I had to run to keep up on these “walk abouts” with my Dad. It didn't seem to matter whether it was corn or soybeans or hay, Dad wanted to know the condition of each and every field. I think if he could he would have walked every row. It was as if by sheer force of will, if he was there and watching over it all, nothing bad would happen on his watch. Maybe Dad can take a few of these walks with Jesus now and he won't have to worry about anything, it will be just the joy of seeing what is good. There will be plenty of time, because eternity is like that. Do you know how good your crops grow when they are perfect the way creation was intended to be. Do you know how healthy those crops can get when you can water from the “spring of the water of life”. Do you know how green the crops can grow “in the light of the glory of God”. As the song by “MercyMe” says, “I can only imagine”. As you can tell from this talk with Dad, “I can imagine an awful lot”, so to me this is very cool. Well Dad now knows what farming and raising calves was like in the Garden of Eden and someday I will too, because eternity is like that. I told Dad that he would soon have a new body that worked real good. He could still take as many naps as he wanted (he was big on naps even when he was younger), but he wouldn't have to take a nap for any other reason than just the sheer “joy” of it. He would also be able to “throw bales” again like he could when he was 30. Maybe bales aren't good theology, maybe like the hymn says he will be “bringing in the sheaves” or something, but the idea is he will be picture of health and vitality. Won't that be something, because eternity is like that. Time was short and we just didn't have much more time to talk. (Remember I was doing all the talking and he was doing all the listening.) About a half hour later he took that last breath in this world and walked through the door into eternity. I thought I would give you all a little window on my final hour with Dad and what was important about his life. Some day soon Dad and I can finish that conversation. In fact Dad is hoping that everyone he knows will be there with him, because eternity is like that. Jenna our middle daughter is a senior in high school this year and in a few months she will graduate from high school and start the rest of her life. Instead of calling Jenna's graduation something solemn, we will celebrate that event as a right of passage, we will throw a party and we will call it commencement. We gathered together at this funeral for a similar commencement for Dad, to honor him, to celebrate his life, and remember all the things he means to us. We have a deep joy that Dad is alive for all eternity, we will see him again soon, and we rejoice that he is farming with Jesus. Life is a great adventure and Dad is just getting started! Because eternity is like that! I wrote this because this final hour with my Dad was very precious to me and I wanted to share it with those that know him and with my friends. Our view of eternity is often narrowed, by our traditions and the shear grief of the separation of death, to a very finite set of hymns and platitudes. A platitude is a statement of moral content that has been used so often that we don't give it the thought it deserves. To understand my Dad and his eternal destiny, we have to expand our horizons (but still well within the doctrines of scripture), we have to consider all of what scripture says about eternity and our relationship to God. This talk with my Dad is endearing to me and many others who knew him but it is also my goal to be theologically accurate and to expand our horizons on eternity. If you want to study more on this topic I would recommend, “Heaven” by Randy Alcorn. My Dad was at that same time, one of the easiest and hardest men to get to know. He was quiet, gentle, predictable, and friendly, his friends knew him that way. He was also at times single minded and maybe just a little bit stubborn. 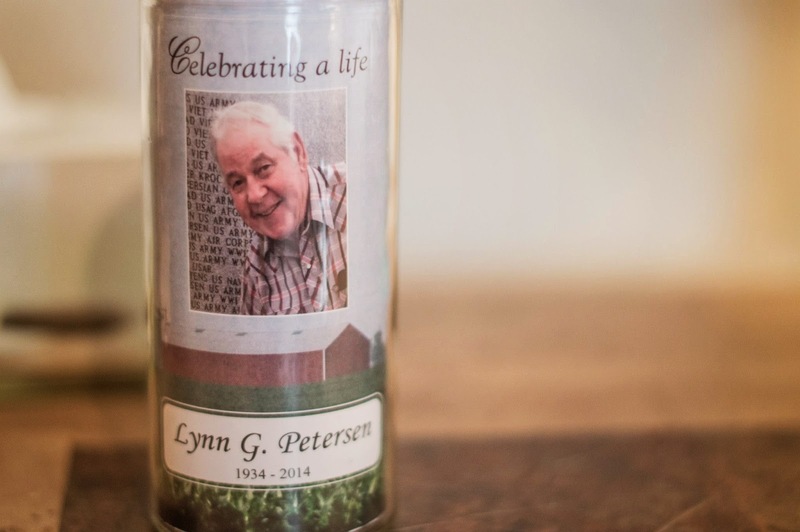 Not everyone knew the depth of his passions for innovation in agriculture, conservation, and discipleship of his fellow farmers in building soil biology and structure. In many ways he was 20 years ahead of his time. His agricultural legacy is that the soils on his farms were better through his stewardship of 50 years than when they passed into his hands from his father. That is a remarkable feat that very very few in agriculture have achieved. Thank you for your interest, it honors my father.